I tend to think we live in a world where Lamborghinis and Ferraris simply tolerate each other because they have to. If given the chance, they'd go nuts and try to kill each other. 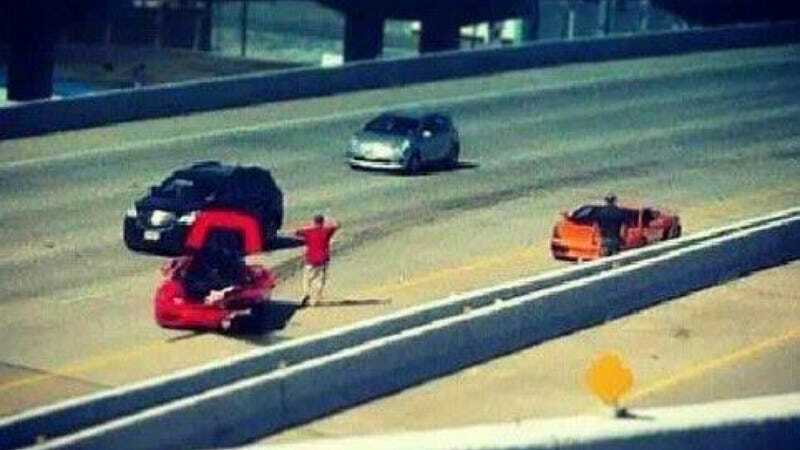 I bet that's what happened when this Ferrari 360 and Lamborghini Gallardo battled in Dallas this weekend. Details on the crash are scarce, but this is what we do know: There was a Ferrari and a Lamborghini on the highway. It appears they came in contact with each other. A witness has said that the cars were not racing. Both cars are damaged, and in the case of the Ferrari, it looks pretty bad. There is speculation that the cars came from an exotic car rental in Dallas. If that were the case, that could mean that rather inexperienced drivers were behind the wheel and someone misjudged following distance or braking or was trying to show off. Then again, if the cars were privately owned, it could mean that inexperienced drivers were behind the wheel and someone misjudged following distance or braking or was trying to show off. One thing is for certain: This aggression will not stand.